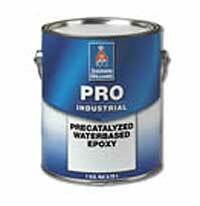 Pro Industrial Precatalyzed Waterbased Epoxy is a single-component, commercial grade waterbased epoxy that is formulated for institutional and commercial facilities such as hospitals, schools and restaurants where repeated cleanings are a critical part of every day. The coating offers washability, chemical resistance and a hard, impact-resistant finish, according to the manufacturer. It is designed to have the smooth look of a traditional latex and to endure washings and chemicals that would typically affect the visible wear over time. The number of coats needed is minimized due to its hide and coverage, according to the manufacturer. The product does not need to be mixed or measured and requires minimal cleanup time. The pot life is not limited. It is available in two sheens - egg-shell and semi-gloss.